Welcome to the July 2012 edition of The Director's Dilemma. Miriam is the Regional Managing Director for a large multi-national company. She oversees a group of companies that manufacture and sell products across the region and also export from it. One of the subsidiaries in her group is in a country that has a small market for the products and is fundamentally unprofitable. She has recommended on several occasions that the board allow her to close this subsidiary and supply that market by importing product from other group companies. She has backed her recommendations with detailed market analyses and projections as well as implementation plans. Each time the board has denied her request and she is forced to continue to see the subsidiary drain her region's profits and the shareholders' returns. Last time the board met in her region she made the usual request and was denied again. She lost her temper and said some fairly harsh words in an unprofessional tone. Miriam is a professional manager and has produced good results so her transgression was forgiven. However the board is, once again, meeting in her region and she has another invitation to present her recommended strategy to them. Before addressing the board again, Miriam needs to find out why its members have so far refused to close the subsidiary. There may be a surface agenda as well as a hidden agenda, and she needs to uncover both. Once she finds out what the real concerns are, she needs to factor them into any proposed solution, which may be something other than her first choice. When proposing the eventual solution, Miriam should first acknowledge respectfully the concerns about the proposed closing, and then explain the challenge she has in balancing these concerns with the need to be fiscally viable. The fact that she acknowledges the board's concerns with utmost respect will likely make it easier for the board to listen to her proposed solution. Again, the proposed solution would probably not be an outright shutdown, but one that would somehow optimize the positive outcomes and minimize the risks. Of course, there is a possibility that Miriam will discover that the board's resistance to a shutdown is not legitimate but is emotionally or personally-based (e.g., the board Chair is the one who orchestrated the start-up of this subsidiary and takes personal offence to any suggestion of a shut down). If this is the case, Miriam may consider whether she can tolerate working in this setting. If her professionalism is substantially compromised, she should consider resigning. One other issue to consider is whether the board should even be involved in decisions to start-up or wind-down a subsidiary, or whether such decisions should be delegated to the CEO who would make them on strictly professional considerations. However, such a change would require a revision of board policy to delegate more authority to management and remain focused primarily on strategic priorities, fiduciary duties, and organizational policies. Eli Mina is a consultant on board effectiveness, shared decision making, and meeting procedures. He is the author of "101 Boardroom Problems and How to Solve Them" and is based in Vancouver, Canada. Were the assumptions right but the world has now changed? Have the reasons for setting up in such a small market ceased to exist? Can the aims of the subsidiary be addressed by another strategy? Loss of temper (or any emotional control) is not acceptable behaviour for a senior executive. Miriam is lucky to have a second chance. She must make the most of this by establishing a strong shared understanding of strategy for the subsidiary. She needs to present the facts and align herself with the board by building agreement about what the subsidiary was set up to accomplish before she asks the board to endorse a change of strategy. She then needs to demonstrate that the board can rely on her leadership to implement the strategy she is recommending. This is not just a question of financial logic and brief implementation plans; she must address risks including legal issues around staff redundancies and closure of facilities. The board needs to satisfy itself that the strategy recommended will be satisfactorily implemented under her leadership. Board time is precious and Miriam should write a good board paper so that all directors are able to engage in a productive discussion and confidently make a decision. If the board is still unwilling to close the subsidiary she will just have to carry on running it. By engaging in a proper high level discussion Miriam should gain an insight into the reasons for retaining a loss-making subsidiary. She may even find that she agrees with the directors. Miriam needs to relax. It is the board's decision, not hers. She has done her duty by providing the information required to facilitating a proper debate and decision. Miriam is forgetting that the definition of insanity is doing the same thing over again and expecting different results! If the board is saying 'no' - then it's 'no'! The good news for Miriam is that 'no' is just feedback that she didn't properly understand her audience's attitude. Miriam simply hasn't reflected to the board that she understands their perspective before seeking approval. 'No' means try again, just do something different! To date Miriam has presented her logic, data and analysis and only covered what she wanted to say, and it's not working. Miriam should remember, 'it's not about me, it's all about the audience'. I suggest Miriam think about the issues from the board member's (not her own) perspective. She should ask herself, 'what is this audience thinking, feeling and doing in relation to this issue?' She could phone each board member prior to the board meeting and elicit their concerns. She could seek feedback from her direct reports as they are possibly more connected to the issues at the coal face. I expect Miriam would find that her previous approach was misdirected. Instead of focusing on profitability (her main concern) there's probably a different matter getting in the way of their approval, such as a prior commitment to the staff in the unprofitable subsidiary or to the wider financial market regarding the closure of the subsidiary. We are more likely to be influenced by our emotions first and then substantiate our views with logic and data. It's important that Miriam dedicates some time in the opening of her upcoming board presentation to re-establish rapport with her board. Only then is she in a position to deliver the relevant facts and data based on her assessment of their perspective. This matter is important, so I encourage her to allocate the time important matters deserve. Miriam must plan her approach and rehearse until she is confident. 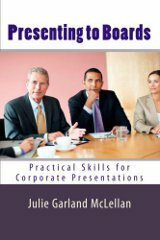 A professional presentation skills coach can help dramatically with the necessary preparation for this type of business presentation. Michelle Bowden, CSP is a Master of Influence and presentations coach. She is the author of "Don't Picture me Naked" - how to present your ideas and influence people using techniques that actually work. She is based in Sydney, Australia. Book review - In their quest to build outstanding organisational performance, directors will often consider issues such as how to foster a working environment that supports new ideas and innovation. Here's my review of Steven Johnson's thought-provoking book "Where Good Ideas Come From". Presenting to Boards - This issue has focused on the high stakes world of presenting in the boardroom. There is (as far as I know) only one book that has been written specifically to meet the needs of board presenters. As the author I highly recommend it. I will declare a conflict of interest but hope you will get a copy if you or your executive team need any help in this area. Praise for All Above Board - CPA Australia reviewed the 2nd edition of "All Above Board" in the June 2012 issue of their journal 'In the Black'. The review highlights the crucial differences between public sector and private sector boards and concludes that the book emphasises practical solutions to real-world problems which is exactly what I hoped it would do! Read the review. Farewell until the next issue (due 1 August 2012).